The Keith McMillen Instruments (KMI) SoftStep foot controller is the latest in a long line of products developed by Keith McMillen in his life-long quest to find a way to play music with an ensemble using extended-capability instruments, moderated by computer intelligence. Along the way, he has created new instruments, patented inventions and started several successful companies. The extremely simple user interface hides a wealth of functionality. McMillen founded Zeta Music in 1979, and over the next few years developed the world's first programmable MIDI mixer, electric violins (with and without MIDI capability) and the Zeta Mirror 6, probably the finest MIDI guitar controller of its age. Later, as Vice President of Gibson Guitars, he ran G-WIZ (an R&D lab for Gibson) and then, as director of engineering at Harman Kardon, he headed a division dealing with complex audio processing and distributed music networks. In 1999, he founded Octiv Inc, an Internet audio signal processing company that was subsequently sold to Plantronics in 2005. Now, through KMI, Keith McMillen funds the Beam Foundation, which aims to spark a new Western classical music based on today's technologies and aesthetics. Released in 2011, the SoftStep takes an extremely innovative approach to foot control, by combining a unique form factor, dedicated control and programming software and multi-directional, pressure-sensitive pads to output continuous controller information that can be mapped to any MIDI or OSC (Open Sound Control) destination. There's no confusing which pedal is which, even on the darkest of stages! For such a comprehensive controller, the SoftStep is surprisingly small and light in weight, due in no small part to its carbon-fibre and elastomer construction. Supplied with it are a protective sleeve, a 15-foot USB cable, and an eighth-inch to quarter-inch expression-pedal adaptor. The top of the SoftStep is 450mm long by 105mm deep and carries the two rows of 40mm-square 0-9 pads and their associated bi-colour LEDs, a four-digit alphanumeric display and a diamond-shaped four-segment navigation switch pad that is angled slightly to make front-to-back operation easier. 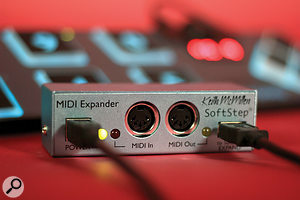 The MIDI Expander allows you to use the SoftStep to control MIDI devices without the need for a computer.The USB connectors (Type B for computer and a mini-A Expansion port for the optional external power supply or optional MIDI Expander) and the quarter-inch jack for an expression pedal sit in a pod on the right rear edge of the unit. Although the unit's surface isn't overcrowded, it is quite petite and if, like me, you've got size 12 feet, you're going to have to give a bit of thought to your footwear to get the best out of the SoftStep, since its 10 pads are not just buttons: they're responsive to five degrees of control, namely X-axis, Y-axis, clockwise rotation, anti-clockwise rotation and pressure. It is this level of response that lies at the heart of the SoftStep's functionality. First up, as is becoming the norm these days, it's a case of downloading and installing the SoftStep editing software and then connecting the unit to a convenient USB port, at which point it powers up to reveal an attractive blue electro-luminescent backlighting and installs, without any drama, on both Mac and PC. The SoftStep is also iOS class-compliant, so it installs just as easily on iPad and iPhone. 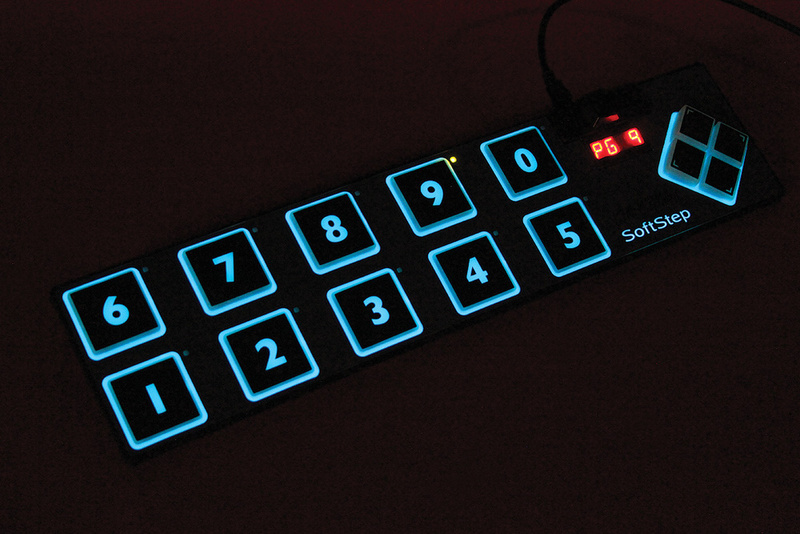 The control software is used to configure the SoftStep via USB and is available for both Mac and PC. The SoftStep can operate in two modes: Hosted mode, in which the editor is open; and Standalone mode, which not only requires no editor application but also, with the optional MIDI Expander and its power supply connected, requires no computer. In Standalone mode, the editor is used to pre-programme Scenes (a set of MIDI message mappings for each key), which can then be recalled sequentially using the left/right arrows of the diamond switch. Scenes can be organised into Setlists, limited to 16 scenes in Standalone mode, and these can be stepped through with the left/right arrows. As soon as you open the editor, you'll realize just how versatile (and complex) the SoftStep can be. There isn't space to go into the scene-editing possibilities in detail (you really need to download the manual from the KMI web site and watch the videos). Suffice it to say that each pad can send out up to six simultaneous data streams (chosen from 35 possible sources) to up to six (of a possible 14) destinations. In Standalone mode, properly programmed and hooked up to its minuscule (4 x 1.25 inches) MIDI expander, the SoftStep is potentially the most powerful MIDI-based foot controller that I've come across. In Hosted mode and set up for a particular application, the SoftStep moves into a territory where its real-time control possibilities allow you to fully integrate that application into a live performance. Videos and tutorials on the KMI website illustrate SoftStep integration with ElevenRack, Logic, Mainstage, S4, Traktor, Ableton Live, iPad, the Buchla 200e and Stutter Edit, to give you some idea of just what can be done. The SoftStep also allows you to access its raw data output and you can, for example, use that data in Max for Live, a toolkit that allows you to build new devices for Ableton Live. The SoftStep includes a development kit for Max/MSP, including Max MSP for Ableton Live. Although the SoftStep ships with a few presets that give you a taste of what it can do, it really isn't a simple foot controller that you're going to get to grips with in a few minutes. To get the best out of it, you're not only going to have to study the manual, but will also need to invest both time and mental effort. 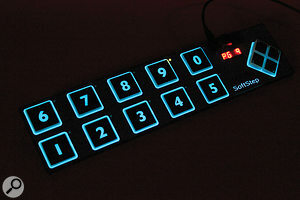 For example, each bi-colour Pad LED has a total of 18 display modes to choose from — giving you a total of 180 choices. When it comes to programming the pads, you have four options for on/off functions (long or short single and double taps) plus the other four degrees of control mentioned earlier to consider, as well as the possibility of six simultaneous data streams from each pad — and that's before you start on the Nav pad, any Expression pedal and the alphanumeric display. Then there's the question of the 12 individual pad sensitivity settings. Talk about keeping a low profile! Fortunately for our collective sanity, the SoftStep is extremely logical in operation, and as you begin to understand the various screens, you'll find the programming process coming to you quite quickly. However, as your confidence grows, you'll find deeper and deeper levels to get into, and very rapidly you'll find yourself thinking those dreaded words "I wonder if I can do this?” At this point, you'll probably discover not only that you can, but also that there are many levels of subtlety awaiting you. In real time, you could modify one data stream with another from the same pad and, by setting different sensitivities for each data stream, you could easily account for the differences between seated and standing operation. If you're a DJ, guitarist or keyboardist using computer software on stage, the SoftStep is probably the controller you've been waiting for. 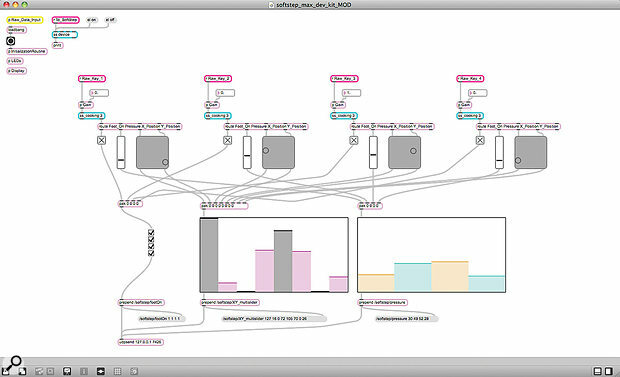 The depth and universality of its programmable functionality mean that it is now possible to exert real-time continuous control over multiple parameters, thus allowing the close integration of computers running software instruments, amplifiers and other programmes into the intimacy and subtlety of live performance. 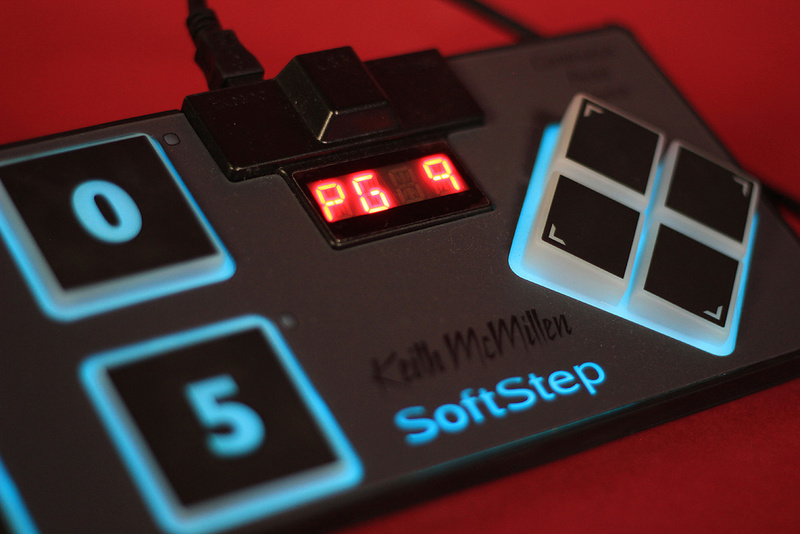 If you are looking to fully integrate computer software into your musical performances, the KMI SoftStep is a foot controller that you should seriously consider purchasing. I recommend that you do. If your control needs are simpler, there are several MIDI foot controllers available, such as the Behringer FCB1010, the Rolls MP128 MIDI Buddy and the Rocktron MIDI Mate. However, none of these offer the degree of control that the SoftStep does. Learning every feature could take quite some time. Large feet need a careful choice of footwear. The SoftStep is probably the most versatile and impressive foot controller out there, and should appeal to guitarists, keyboardists and DJs alike. SoftStep £225; SoftStep MIDI Expander £44.99; bundle £256.49. Prices include VAT. SoftStep $259; SoftStep MIDI Expander $45. Keith McMillen Instruments +1 877 812 0408.